Do you feel threatened at all? Do you wish YOU shared your daughter’s traits? Sure, it can seem so simple, but it isn’t really is it? The question about being a mom to a child who has other parents made me stop and think. What was it that made it possible to invite my children’s other parents into our lives, with open arms? Why DID I embrace open adoption so fully? And how? Early in our adoption process, about the time we worked on our first adoption profile, I made the conscious decision to not only accept but LOVE our story, warts and all. 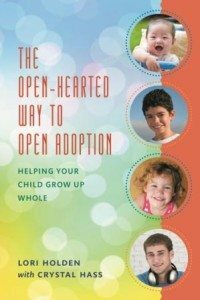 And looking back, I can see that every great spiritual lesson I’d learned previously helped me prepare to embrace open adoption. A mentor once told me that being grown up means seeing things the way they are instead of how you wish they were. 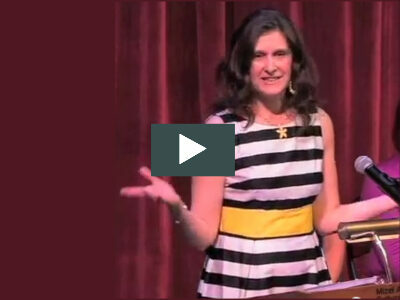 Once I became a parent, I had a conscious choice to make each day, each moment. I could lament the fact that I did not give birth to my children and that my DNA and my husband’s did not swim in their veins. OR I could be ecstatic that my children were who they were. In other words, I could see my life in a way that made me sad and frustrated, or I could see my life in a way that made me fulfilled and happy. It’s only when I’m NOT conscious that I choose the former. When I’m making the choice with full awareness, it’s sensible and easy to choose the latter. This doesn’t mean that I wear rose-colored glasses or that I never let myself think about what isn’t. Instead, adoption — for both me and for my children — is about becoming whole, about the freedom to wonder, explore, question, and ultimately accept. I DO examine the feelings I have when I notice Tessa has a set of toes that look nothing like mine, or when Reed demonstrates an athletic talent that clearly didn’t come from me. I DO consider what parenting them might be like if we shared common ancestry. Would I understand her learning styles better? His coping mechanisms? But I don’t get stuck in these thoughts. I think them, feel them, release them. If the aphorism, That which we resist persists, commonly attributed to Carl Jung, is true, then I NEED to be able to think a scary thought or feel a scary emotion in order to release it. Otherwise the scary thought or emotion has and builds power. Power over me. I neutralize the scariness when I am able to allow the thoughts to move through me and not get stuck in me. And what’s more? I show my children that “icky” thoughts and feelings don’t have to be scary. In fact, they can be illuminating and, eventually, liberating. Now, after getting to know K and her amazingly supportive mom and brother, we can see how our family could so naturally be extended in an open adoption. This baby will be born to an outstanding young woman, with a fantastically loving grandmother and sweet uncle. If we should become this baby’s parents, it would feel only natural to want these people in our child’s life for the love and connection that only they can provide. We will be able to give our child so much, but that heritage is the one thing we can not provide; we can only work to ensure that it is accessible. For us, it is about abundance. We feel no need to restrict the love that may flow to and from this child. Quite the opposite — we believe that the more people to love the child, the better. I realize it [open adoption] is not necessarily intuitive, unless you can truly view it from the child’s perspective. I think to really open one’s self to openness, adoptive families first need to overcome their own fears and insecurities and challenge their own assumptions. Is there reluctance to enter into an open relationship due to concern that the child won’t know who his/her “real” parents are, or will “reject” the adoptive parents for the birth parents? Is there fear that it will feel like “sharing,” or that the birth family will try to “interfere” or “reclaim” the child? Is it just “inconvenient” to maintain another relationship? Is there a lack of trust? Every spiritual avenue I’ve steeped myself in teaches that at each moment you can live from love or from fear. Love is rooted in abundance and is unlimited, originating from our true, divine nature. Fear comes from separation and from our false self, our ego. Our small, scared, limited ego. In some ways, “Just embrace!” is so much easier than “Just adopt!” After all, there is no paperwork, no white-gloved social worker, no proving myself to an external authority, no power outside me deciding the outcome. And for that same reason, “Just embrace” is so much more difficult than “Just adopt.” For only I can do it. No one will tell me if I am doing it well. It’s all me, all the time, just trying to stay aware of my motives and fears, and consciously choosing love and embrace wholeness at every turn. I did write that, didn’t I? 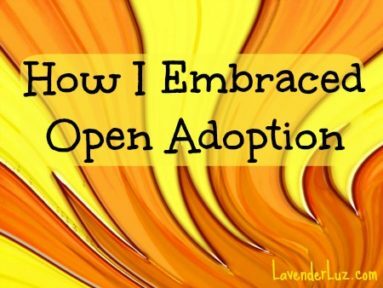 you are so right though, especially with this: “every great spiritual lesson I’d learned previously helped me prepare to embrace open adoption.” you got that right. I completely agree with Luna’s idea that the more people who love a child, the better. I just have such low expectations of people that I would be hard pressed to believe that someone would be able to stay in their child’s life and not try to parent the child. And since I am terrible at resolving conflict and maintaining boundaries peacefully, I doubt that I would ever have the ability to co-exist in that sort of relationship. That’s why you have my admiration. Great post! So very well put. This is such a great post. I absolutely love your perspective. Oh, Lori. I love every word of this post. Almost as much as I love you. Thank you for writing this. wow, Lori. I did not adopt and so while I don’t know about all the feelings that go into thinking about how to “adopt” or “embrace” but I can tell you that your post touched me, because in being a mother I think we all have to make choices to embrace each day, to be inclusive with our children’s friends and other parents etc, for the good of our child..to help them grow and to help “us grow”. I compeltely admire you in so many ways, but here in lies one of the BIG reasons why…you don’t resist ….you just go and let Life take you, in that way I know that the path will be right and good. You truly are such an inspiration. Not just as it relates to your adoption journey, but your spiritual journey as well. Once again, you’ve given me a lot to think about! It seems like a “duh” kind of thing in hindsight, and effortless, though your Drama To be Mama readers know it was not so at all. Wonderful post. So much of what you said also applies to donor conception. Regardless of the fact that I gestated and gave birth to her, I look at my daughter and can not deny that she is not of my DNA. But as you said, “I think them, feel them, release them.” She’s my girl, and I am blessed to have her. A wonderful, unique little person that I get to learn about every day. Woah! This is where I hope to be and I just posted about it although not put as eloquently. Thanks again for sharing. I remember you once told me that you got so busy with kids you healing from IF without really noticing. I think I am in the midst of that now. I rarely find myself thinking about DE anymore and when I do it doesn’t make me sad. What a great post … we are parents of two girls in very open adoptions although at the beginning of our journey we would have never thought it could work … we do embrace how our family has grown and how every day we are thankful for the blessings in our life … our girls are just 3-1/2 and 1-1/2 so their independent thoughts are not fully known to us yet. I will say my heart sang recently as my elder daughter talked to her birth mom on the phone on her own prompting … It made me feel so good that they are just beginning their own relationship! It makes it all worth it! This is such a great post. I always feel like I learn so much from you. Now if I can just remember it all. What a great post. I love reading your thoughts and insights. So true . . . I love how you always put my own thoughts into eloquent words and phrases. You are such a role model for me! I’m lucky to have moms like you blogging about open adoption so that I know where I’m headed in the next several years. oh yes, this is a good one. Thanks for sharing this. It was a wonderful post. Hi! Thanks for this beautiful post. Although it is specifically about your open adoption, I think it applies to so many areas. Here from ICLW , even though you talk about your experience with open adoption i think that the feelings and the emotion are felt by all of those around. You have a beautiful story! 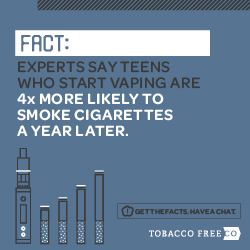 What an amazing insight! I think the ideas in your post apply to so many things that scare us and keep us feeling small and weak. Thanks so much for sharing. From ICLW. Thank you for sharing this ICLW post. You describe much the way I am trying to live my life as well. In the present, embracing vs. resisting. All great stuff! My brother was adopted way back in 1972, and I was always intrigued by the fact that we knew so little about where he came from. Baby boy, 2 months old, here you go! For the era, my parents were quite open about his adoption, but certainly no one thought of your kind of open adoption in those days. The more adults to love a child, the better. ….. to choose to love a story of pain…. This is something I’m not very good at. I think I can imagine a time where I would not choose my story to be something else, but to love it? My husband always comments on how much I fight things, and how this ultimately makes my journey a lot harder. I can see the truth in it but by f*%k it’s hard to change. Thanks for honestly admitting that it is something you can do with reflection and consciousness, but it’s not necessarily how your unconscious responds. I guess the difference shows where growth and maturity comes from. I guess I’ll get better at it with time. Stopping by a little late from ICLW. I love this post! Especially the line “being grown up means seeing things the way they are instead of how you wish they were.” So so true. I love this post too! You chose a courageous and loving path. It would be so easy to choose fear and keep the birth out of the picture, but you don’t. It’s great. Thanks for sharing. Oops, I mean to say “birth parents out of the picture” above. Thank you for another beautiful post. In fact, one of the things that we grieve in our adoption is that our children’s birth parents have not been able to be very engaged. We respect their boundaries, and will never stop being grateful for the gift they provided. And maybe, in time, they will feel safe enough to provide that “heritage link” that was described above. In another vein, I’m always thrilled when I hear people talking or writing about walking through painful emotions. What a wonderful, healthy example you’re setting for your children. I always enjoy reading your words! Pingback: Open vs. Closed. I’m scared!